God is a God who will do everything possible to make us righteous. We should also note our cooperation is required. We can’t be righteous if we do not accept it from God. God wants us righteous so we can be ever with God, now is the time to decide if we will accept righteousness from God, or not. Three weeks ago we looked at righteousness from the perspective of the Word being near. The Word of course is the Word of God, which we see sometimes as scripture and we also know as Christ himself. Jesus is the living Word and his message becomes the living word. Through him we come to know the word, which is near and knowing the word brings us near to the Word. The old covenant readies us to know how significant God’s word is and can be, it leads us to be ready for God. Two weeks ago our readings pushed us to recognize we are citizens in heaven. Like citizens anywhere, to be a citizen of heaven comes with certain rights and responsibilities. We have the right to be treated equally, with freedom and trustworthiness. Also, we are responsible for living up to our citizenship by representing heaven well, encouraging others to immigrate (become citizens of heaven) and to be united with every other citizen of heaven. As we claim our citizenship in heaven, how we live will ready us more and more to receive God’s grace of righteousness. Last week we were guided by the readings to repent or perish. To repent can mean to regret something but in the gospel the word is based very much on the idea of changing direction. Jesus came so we could become new in him. In Jesus we are called to live a new life, to turn from the life we have lived without Jesus and to live our life completely within Jesus. If we do this we will live eternally, if we don’t change we will perish. This week we are guided by the readings to know that we are “in Christ a new creation.” It means we are “rebooted.” We accept a new spirit from heaven and we live as though our life will continue forever rather than end when our body fails us. The readings lead us to know we are anew creation. We are shown the nation of Israel as it becomes new, Paul tells us what it means to be a new creation in Christ and a story about two sons who both needed to become new creations. To be a new creation in Christ leads us to the Kingdom, and changes that will be part of a process to make us holy, receiving righteousness from God. 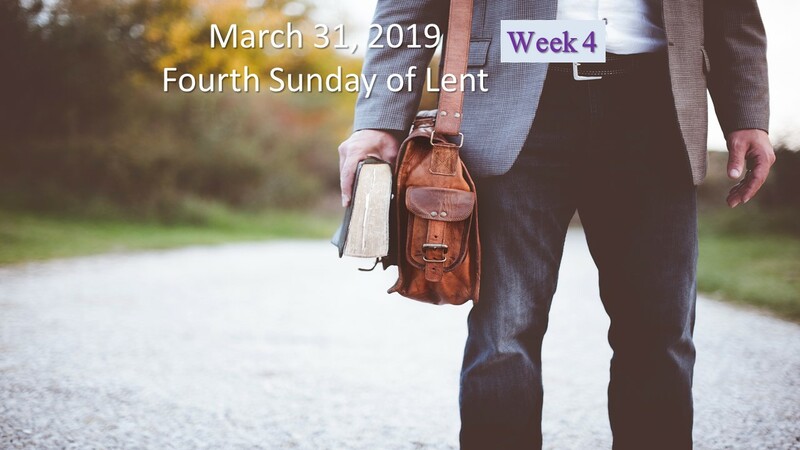 The readings this week are from the Lectionary for the Fourth Sunday of Lent; Joshua 5:9a, 10-12; Psalms 34:2-3, 4-5, 6-7; 2 Corinthians 5:17-21; Luke 15:1-3, 11-32. The readings guide us toward becoming a new creation in Christ, which in turn leads us to righteousness from God. In the first reading from the Book of Joshua we read about the beginning of life in the Land of Canaan, the land God promised to the ancestors of Hebrew people. Joshua has taken over for Moses as leader of the people and is responsible for leading them across the Jordan and the takeover of the land. We read the Passover is being celebrated in the Promised Land for the first time. The Israelites are able to use grain from that region for their unleavened bread and they have access to agricultural products of the land. God no longer provides manna to them daily as he had in the desert. Once they have land rich that they could provide for themselves they no longer need to receive special help as they did in the desert. They are new in the land and they are a new nation. God has led them to their new life and now they are new creations of God. They will stand as witnesses to their God and all that is possible through Him. It is the first example of a new Creation in Christ. They were the people who would tell the stories of God and the promise of sending an anointed, the Christ. In the second reading from Paul’s Second letter to the Corinthians we read about the new creation brought about by Christ. There is a new age inaugurated by Christ’s death and resurrection that becomes reality for us once we become followers of Jesus. We are to regard no one according to the flesh, we enjoy the life of the spirit, recognizing ourselves and others as more than mere human. We are given eternal life when we are in Christ, which means we live our life knowing that it will not end in death, we live perpetually. We are new, with personal union in Christ, incorporated into his body, we have a new heart, a new ability to love God and others, a new capacity to participate in the reality of God’s kingdom on earth, we become the ministers of Jesus’ church. What we were before Christ has passed away. It is all from God, God is the source of redemption, reconciliation, our relationship with God is restored, which only comes from God, God’s gift through Christ. We don’t imitate Christ, but Christ inhabits us and we witness to a life in Christ. This is the newness provided. We are a new creation, in Christ, “so that we might become the righteousness of God.” We are now able to live for Christ, to offer ourselves in self-giving love for others. God’s righteousness continues to be revealed through us, here and now, not in some after life. We have been made righteous and empowered to walk in the way of Christ. As we are in Christ we inherit that divine will and the righteousness from God. We are a new creation. In the gospel reading from Luke Jesus tells the story that is commonly known as the “Return of the Prodigal Son.” It is a story of two sons and their father. One son can’t wait for his father to die to claim his inheritance and so asks the father for it immediately. The older son stays with his father but seems very resentful and angry about some of the decisions his father made regarding his brother. The father for his part seems willing to do anything to help his sons. Both sons have a life they don’t appreciate or understand with the father. The younger son needs to leave and lose everything to realize what he had is much better than what he has; returning to the Father with a confession and a willingness to do anything to be united with his father again. The older son, although he stays, lives with a kind of cold anger, as though he has done everything for the father and yet he doesn’t feel he is appreciated or is getting any desired special treatment from the father. The father wants both his sons to have an experience of the Kingdom where joy resounds for all. He rejoices when his lost son returns and he wants the older son to rejoice for the same reason. He tells the older son you are here with me always and all I have is yours, yet the older son is not willing to enter the celebration because he somehow feels cheated. This is a message of becoming a new creation. The younger son obviously has to lose everything to become a new creation desiring to be with his father. We can’t be sure about the older son; if he remains outside the celebration that he remains an old creation, dead. But if convinced to rejoice in his brother as the father wishes, he too will become a new creation. Both sons need to become new creations in Christ in order to rejoice in the Kingdom of God. Not realizing they can be a new creation in Christ makes them look for joy someplace else, never knowing it is within their grip if they simply accept. This story can be applied to church people who don’t know what they have, they haven’t had a true experience of God and they are just going through the ritual, or worship because it is what they think they are supposed to do and by doing it will receive the prize at the end of their life. The celebration is already happening, becoming new in Christ is all it takes to enjoy. Once we are a new creation in Christ we are at the feast and will rejoice with everyone else who has found their way to the celebration. These three readings all have a flavor of new creation in Christ. The Hebrew people are newly planted and created as a nation in the land of Canaan. Paul tells us when we are followers we are created new in Christ and have new life, one that we’ll enjoy forever. In the parable from Jesus we see examples of old lives that must become new creations in Christ to rejoice in the Kingdom. In each case righteousness is from God, while Christ’s sacrifice begins the new creation. We can’t do anything to make ourselves new other than participating. We must make the effort to become a disciple of Jesus. We follow God’s will. We accept God’s determination for our life. We join the celebration. These readings are a microcosm of the story of God’s plan to make us a new creation. The first people chosen by God is the Israelite nation. They we formed as one community to support one another and come to believe in God together. God chose them to try to live a life of righteousness so others would know they too could be included in the life of God. It took an entire nation to capture, live, and tell the story of God. If God tried to work through individuals they could be dissuaded easily. God formed the Israelites, God helped them and God made covenant with them, promising to always be there for them. But, God knew this was not the final creation he intended for them. Their role is to stay in relationship with God. To constantly seek God and know that with God they will come to know what it means to be God’s and part of the Kingdom of God. Their story is one where they constantly fail and need redemption to come back to God. Of course God constantly redeems them and brings them a little closer to the plan for them and the rest of the world. In time God used the prophet Jeremiah to declare a new covenant available to the Israelite’s and anyone who choose to enter into the promise with God. The new covenant no longer require a nation of people to follow and be close to God. With the coming of Jesus, becoming the Christ, now individuals can choose to become a new creation. Becoming a new creation in Christ we join a new Kingdom of people, not from a particular nation, we become a member of the Body of Christ. National boundaries are unnecessary, everyone can be a member of the Kingdom of God. As a new creation in Christ we discover relationship is the priority, with God and others. The commands of Jesus to love God and love others take precedent. When we are new in Christ we realize how important it is to be connected not only to the vine (as Jesus tells in the story of the vine and the branches (John 15:1-17)) but with each other on the vine. We learn about this new creation when Jesus speaks to Nicodemus and informs that he must be born from above. (John 3:3) It led to a term many church people called being reborn. It has become a term that has a specific meaning with a particular declared result. But in truth the language “new creation” is much better for us to understand. Today people are constantly trying to “reboot” themselves, to become new. It seems like every New Year’s we make resolutions to become something new. So becoming a new creation is easier to understand than being reborn. Jesus is trying to teach that we must receive a new spiritual life that comes from heaven. Not to receive this new spiritual life means we fail to experience the Kingdom. Being a new creation in Christ we experience and are part of the Kingdom. We receive this spirit from heaven and we are joined with all who are new creations in Christ, with God reigning as King in Jesus. What must we do? We must allow Jesus to inhabit us, becoming a disciple. We become baptized, or declare ourselves followers of Jesus in some manner. We accept the mission of Jesus and prioritize the mission over anything in our life. We don’t earn discipleship but we do need to make an effort to know Jesus through reading of the word daily and by participating in service for others. Hearing the stories of Jesus we know how to be like Jesus and recognizing that serving the poor, the needy, those who can hold a special need or special desire to be loved, brings us closer to Jesus in reality. To hear the word and to provide for the Word through others. This is how we accept becoming a new creation in Christ. The path to righteousness is a path through new creation. We are created new in Christ when we choose to accept Jesus and do the will of the Father. To receive righteousness from God we must turn away from our natural inclination to be self-serving, prideful and hypocrites. Becoming new creations in Christ we turn toward God, we become models of righteousness, we are disciples and our life is filled with hope. Becoming a new creation in Christ is a way to recognize who we are and whose we are. It opens us up to receive perfect righteousness from God. Of course we must hang on to our new creation status, we must constantly turn away from what separates us from Jesus, and do the things that bring us closer to Jesus, letting the Jesus in us be revealed to all who meet us.